Chinese and Venezuelan oil giants began constructing their first joint venture refinery in South China’s Guangdong province Wednesday after a decade of planning and negotiations and a subsequent delay. Located in an industrial zone in Jieyang, the joint venture is 60% owned by China’s state-owned China National Petroleum Corp. (CNPC) and 40% held by the Petróleos de Venezuela SA (PDVSA). The 65.4 billion yuan ($9.55 billion) total cost of the 953-hectare (3.68-square-mile) project, which includes a chemical complex and related transportation facilities, is China’s largest one-time investment in a chemicals and refinery integration project. Trial production of the refinery is set to start in October 2021, and trial production of the chemical complex two months later. The project will mostly process lower-grade crude oil from Venezuela and the Middle East, with annual production capacities of 20 million tons of refined oil, 2.6 million tons of aromatics, and 1.2 million tons of ethylene per year. 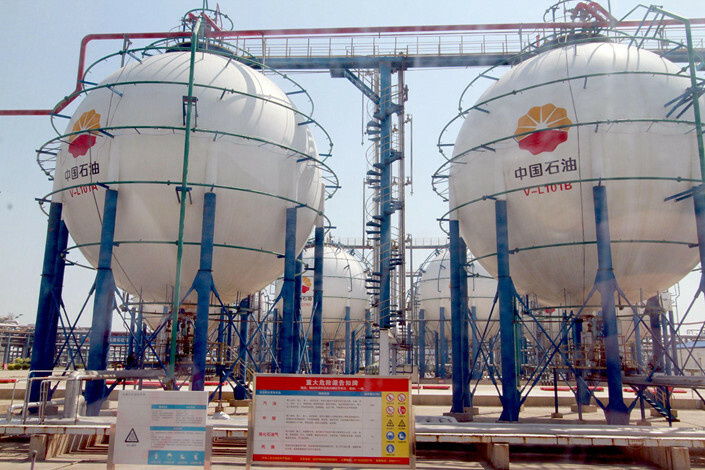 Guangdong has become a magnet for foreign investment in chemical projects. Apart from the Jieyang project, international chemical and oil giants, such as Exxon Mobile Corp., BASF Group of Germany and Borealis Group of Austria, have planned to build chemical production bases in various cities across the province. After nearly a decade of planning and negotiation, the project won preliminary approval from China’s National Development and Reform Commission — the top economic planning body — in 2009 and obtained clearance from the environmental watchdog in 2011, according to the CNPC. But construction was delayed partly due to a shortage of oil from Venezuela. A turbulent domestic political situation in the country and escalating social conflicts following the 2013 death of Venezuelan President Hugo Chavez caused a sharp decline in the nation’s oil production. The situation was worsened by the free fall of international oil prices starting in the second half of 2014 that dealt a blow to the Venezuelan economy. Venezuela’s oil production this year is expected to be half that of 2012, when construction on the Jieyang project was originally scheduled to begin, according to Bloomberg data. Analysts believe the oil market in Venezuela will continue to languish. The country’s crude oil production has plunged to its lowest level since 1950 owing to domestic inflation, social unrest, labor loss, and U.S. trade sanctions. Negotiations on the Jieyang project between China and Venezuela resumed last year. The renegotiated agreement included crude oil from the Middle East as an alternative supply source. China is a major buyer of Venezuelan oil. Data from the General Administration of Customs showed that in the first three quarters this year, China’s purchase of crude oil from Venezuela averaged 364,100 barrels per day, down 28% from the same period last year. For a long time, cooperation between China and Venezuela in the energy sector has mainly followed the form of loans in exchange for oil, with financial backing from a fund established in 2007 by China Development Bank. Under this arrangement, Venezuela repays loans from China with crude oil. But the domestic turmoil in Venezuela has exposed Chinese lending to greater risks. According to Cui Shoujun, director of the Latin American Research Center of Renmin University of China, China’s total financing to Venezuela as of early 2017 had exceeded $60 billion, of which at least $20 billion was unpaid. Crude oil prices are gradually picking up this year, reaching around $70 per barrel, rebounding from a low of $30 per barrel in 2016. They have been in a downward spiral since they peaked in 2014 at more than $100.